Osteoporosis is a multifactorial metabolic bone disease characterized by low bone mineral density (BMD), deterioration of the microarchitecture of cancellous bone, leading to greater bone fragility with an increased fracture risk. One in two women, over 50 years of age has a 50% probability chance of an osteoporosis related fracture. Osteoporosis is considered to be one of the major concerns for the middle-aged women, coinciding with the menopause. Several methods have been developed for evaluating the bone mass like quantitative computed tomography, ultrasound analysis, neutron activation analysis, single and dual-photon absorptiometry. These techniques involve special radiographic procedures and are relatively expensive. The current gold standard for diagnosing osteoporosis is by assessing BMDs, which is measured using dual-energy X-ray absorptiometry (DEXA) scan; however, it has few limitations like the cost and availability. Considering that panoramic radiographs are frequent diagnostic procedures performed during or after several dental procedures, they can be used to identify patients who are at a high risk of osteoporosis. The evidence from the literature in favor of establishing the role of panoramic radiographs being a useful indicator of the general skeletal bone status is mixed. Hence, the study to assess the reliability of these panoramic-based mandibular indices in screening postmenopausal women for osteoporosis was done. A cross-sectional study was conducted on 43 postmenopausal women aged between 45 and 75 years. The study subjects were among those who reported to the Department of Oral Medicine and Radiology, Bangalore, India. Ethical clearance was obtained from the institution with patient's consent. Patients, who were in natural menopause (which was recognized to have occurred after 5 years of amenorrhea and for which there was no obvious pathologic cause) with no history of oophorectomy or a hysterectomy, were included in the study. Smokers and alcoholics, patients with any known systemic disease that would affect bone metabolism like hyperparathyroidism, hypoparathyroidism, hyperthyroidism, Paget's disease, osteomalacia, renal osteodystrophy, cancers with bone metastasis, or significant renal impairment and those who were on specific drugs (corticosteroids) which are known to have adverse effects on bone metabolism were excluded from the study. The patients were subjected to panoramic imaging (Planmeca ProlineXC G-XR 10727) with exposure parameters being in the range of 68 kVp and 11mA, 18 seconds using Romexis 2.1.1.R software. 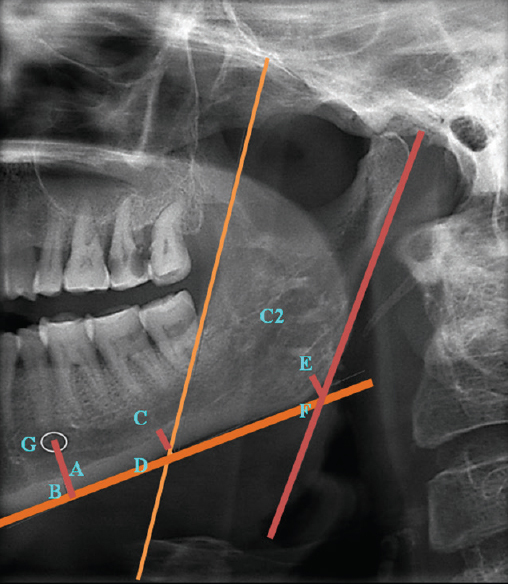 The following indices were calculated on the panoramic radiograph; mental index (MI), gonial index (GI), antegonial index (AI), panoramic mandibular index (PMI) and mandibular cortical index (MCI) [Figure 1]. C3: The cortical layer forms heavy endosteal residues and it is clearly porous. The BMD for all study subjects was obtained using a DEXA scan (Lunar PRODIGY DEXA system enCORE software 2012) of left femur and T-score was recorded. T-score of −2.5 and below was Osteoporotic. Osteoporosis as assessed by DEXA T-score was considered as a primary outcome variable. Various radiological indices computed were considered as primary explanatory variables. Age of the person was considered as other explanatory variables. Initially descriptive analysis of all the explanatory and outcome parameters was done using mean and standard deviation (SD) for quantitative analysis and proportion for categorical variables. The statistical software namely SPSS version, IBM CORP was used for the analysis of the data. Significance was assessed at 5% level of significance (P < 0.05). The mean values of the indices were compared across the categories of osteoporosis by analysis of variance (ANOVA). Chi-square test was used, to compare MCI with the different BMD conditions. According to T-score 10 patients (23.26%) had normal BMD. Twenty one patients (48.84%) were osteopenic and 12 were osteoporotic (27.91%). The mean MI score was 2.45 mm ± 1.1 SD in normal subjects, 3.123 mm ± 0.8 SD in osteopenia group, and 2.641 mm ± 0.6 SD for osteoporotic group. The differences in the mean MI score across the groups were not statistically significant (P = 0.1 and 1, respectively). The mean GI score was 0.92 mm ± 0.4 SD in normal subjects, 1.14 mm ± 0.3 SD in the osteopenia group, and 1.26mm ± 0.7 SD for osteoporosis subjects. The differences in the mean GI score across the groups were not statistically significant (P = 0.7 and 0.3, respectively). The mean antegonial index was 2.18 mm ± 0.7 SD in normal subjects, 2.595 mm ± 0.874 SD in osteopenia group, and 2.266 mm ± 0.7 SD for osteoporotic group. The differences in the mean antegonial index score across the categories were not statistically significant (P = 0.5 and 1, respectively). The mean PMI was 1 mm ± 0.687 SD in normal subjects. In subjects with osteopenia it was 0.790mm ± 0.2 SD. In subjects with osteoporosis it was 0.858 mm ± 0.3 SD. The differences in the mean PMI score across the categories were not statistically significant (P = 0.5 and 1, respectively) [Table 1]. Chi-square test was used, to compare MCI with the different BMD conditions. Distribution of various BMD conditions as elicited by T-scores and MCI. The test results revealed T-score categorization as 10 (23.3%) being normal. Osteopenia subjects were 21 (48.8%). Different linear and qualitative panoramic radiomorphometric indices have been proposed as diagnostic tools for identifying osteoporosis. Panoramic radiographs are relatively inexpensive and they are already used for the diagnosis of oral and dental diseases. In addition, they can also provide information on a patient's BMD conditions and can be certainly used as a screening tool for osteoporosis. In the present study, various radiomorphometric indices (MI, PMI, AI, GI, and MCI) were compared with the BMD conditions obtained by DEXA scan T-scores of the left femur. The ease and convenience for the patient, made us choose left femur as the region of interest for obtaining the bone densitometry values. Cortical thickness of the inferior border of mandible below the mental foramen is the site which is often measured, as it is more accurate and is the representative of true bone status. 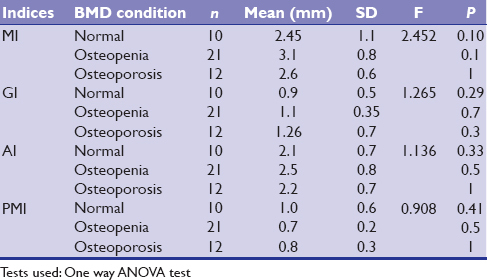 The difference in the mean MI scores across the groups were not statistically significant (P = 0.14 and 1 for osteopenia and osteoporosis, respectively [Table 1]. Our results were in accordance with the studies done by Pal, Ledgerton et al. and Dutra et al. The results of our study were in contradiction to the studies done by Devlin et al. Estera et al. Taguchi et al. and Mahl et al. found MI could significantly diagnose low BMD conditions. Variations in cortical width measurements may have reflected differences in either the point of measurement along the cortex or in perceptual determination of the level at which MI was measured. Measures the thickness of the cortical bone in the area of the gonial angle. According to Bras et al., the relatively constant thickness of cortical bone at the mandibular angle, following the adolescent growth spurt and the decrease in cortical thickness in postmenopausal women, suggested that cortical thickness at the gonion may be a useful parameter for evaluating metabolic bone loss. In our study, the difference in the mean GI scores across the study groups were not statistically significant (P = 0.7 and 0.3 for osteopenia and osteoporosis, respectively) [Table 1]. These findings are supported by the studies done by Mohajery and Ledgerton et al. who also found no significant difference between GI and BMD conditions. On the contrary, Bras et al., Estera et al., Mahl et al., and Gaur B et al. suggested, the cortical thickness at the gonion may be a useful parameter for evaluating metabolic bone loss. Relatively smaller dimensions of cortical width at the gonian region made the measurements of GI difficult in the present study. Measures the thickness of cortical bone in the area located in front of gonial angle. The difference in the mean AI scores across the study groups were not statistically significant (P = 0.5 and 1, respectively) [Table 1] making AI not a reliable index in identifying subjects with low BMD. The difficulties encountered during AI assessment were, localizing the line that “best fits” the anterior border of the ascending ramus. AI was a poor index to use for radiographic osteoporosis assessment, according to the studies conducted by Ledgerton et al., Dutra et al., and Leite et al. Contradictory to these results, Gaur et al. and Bajoria found a significant difference between AI and BMD conditions. PMI is the ratio between the thickness of the mandibular cortical bone and the distance between the mental foramen to the mandibular inferior cortical bone. PMI was presented as a radiomorphometric method in 1991 by Benson et al. who suggested, despite the alveolar bone resorption above the foramen, the distance from the mental foramen to the inferior border of the mandible remains relatively constant throughout life. In the present study, difference in the mean PMI scores across the study groups were not statistically significant (P = 0.5 and 1 for osteopenia and osteoporosis) [Table 1]. Our results were in accordance with Otogato and Ota, Yasar, and Akgunlu who also demonstrated no significant difference between the two parameters. On the contrary, studies have done by Gungor et al. found PMI, a reliable screening tool in identifying patients with osteoporosis. Measurements of PMI are dependent on the identification of mental foramina. Difficulties in assessing PMI could be attributed to an inability of identifying the borders of the mental foramina. One of the most commonly studied parameters of mandibular bone with respect to osteoporosis is the porosity of the mandibular cortical bone. According to our study, MCI was a reliable index in identifying osteoporosis. (P = 0.01) [Table 2]. The findings in our study reported postmenopausal women with distinctly thinner and porous mandibular cortices presented with lower BMDs which were in congruent with the study done by Bras et al. We observed a relatively high frequency of moderately eroded cortex on orthopantomograms (OPGs) of women aged between 50 years and 60 years. This finding was in accordance with the studies done by Ledgerton et al. and Uysal et al. Zlatarić and Čelebić A who reported patients with lower BMD values in the mandible, have a much more porous mandibular cortex. Unlike the other quantitative indices, MCI (qualitative index) did not require exact identification of radiographic landmarks and precise measurements. On the contrary, studies done by Jowitt et al. and Drozdwaska et al. did not show an association between MCI and BMD condition. As MCI is an objective index, there could be several reasons attributed to the varied results. Different sample sizes, different versions of dental panoramic equipment, image quality of an OPG, magnification variations, and presence of ghost images are a few of them to mention. and 12 (27.9%) were osteoporotic. The proportional distribution of MCI categorization was c1, c2, and c3. Out of which 10 (25.6%) subjects belonged to c1 category, 21 (48%) subjects belonged to c2 category, and 11 (25.6%) belonged to c3 category. The proportion of categorization was approximately equal, with narrow internal differences between BMD conditions and MCI categories, hence the difference between the two groups was statistically significant (P = 0.01) [Table 2]. Our results suggest that, MCI has a good reliability and diagnostic accuracy in identifying patients with low BMD. Women with pronounced thinning or resorption of inferior mandibular cortices; c3 category should be referred for further osteoporosis investigation. Postmenopausal women classified as c1, without any risk factors for osteoporosis need to have to get their BMDs evaluated. Women under c2 category, corresponding to osteopenia must undergo periodic check-ups and an appropriate treatment must be rendered to prevent the risk of osteoporosis. The limitation of the present study is, specific cut off values could not be assessed for the various indices due to the small sample size. Watanabe PCA, Farman A, Watanabe MGDC, Issa JPM. Radiographic signals detection of systemic disease. Orthopantomographic Radiography Int J Morphol 2008;26:915-26. Sinha K. Fracture alert: India Faces Bone Ultimatum. TNN 2010. Available from http://timesofindia.indiatimes.com/india/Fracture-alert-India-faces-bone-ultimatum/articleshow/6018314.cms. [Last accessed on 2015 june 25 ]. Drozdwaska B, Pluskiewicz W, Tarnawska B. Panoramic-based mandibular indices in relation to mandibular bone mineral density and skeletal status assessed by dual energy X-ray absorptiometry and qualitative ultrasound. Dentomaxillofac Radiol 2002;31:361-7. Sipos W, Pietschmann P, Rauner M, Kerschan-Schindl K, Patsch J. Pathophysiology of osteoporosis. Wien Med Wochenschr 2009;159:230-4. Law AN, Bollen AM, Chen SK. Detecting osteoporosis using dental radiographs: A comparison of four methods. J Am Dent Assoc 1996;127:1734-42. Calciolari E, Donos N, Park JC, Petrie A, Mardas N. Panoramic Measures for Oral Bone Mass in Detecting Osteoporosis: A Systematic Review and Meta-Analysis. J Dent Res 2015;94:17S-27S. Gaur B, Chaudhary A, Wanjari PV, Sunil MK, Basavaraj P. Evaluation of panoramic Radiographs as a screening tool of osteoporosis in Post menopausal women: A Cross Sectional study. J Clinical Diagn Res 2013;7:2051-5.
WHO scientific group on the assessment of osteoporosis at primary health care level. Available from http://www.who.int/chp/topics/Osteoporosis.pdf. [Last Accessed on 2014 Jul 02]. Mudda JA, Bajaj M, Patil VA. A Radiographic comparison of mandibular bone quality in pre-and post-menopausal women in Indian population. J Indian Soc Periodontol 2010;14:121. Sumano P, Sunita A. Evaluation of panoramic radiomorphometric indices in Indian population. Cumuriyet Dent J 2013;16:273-81. Ledgerton D, Horner K, Devlin H, Worthington H. Radiomorphometric indices of the mandible in a British female population. Dentomaxillofac Radiol 1999;28:173-81. Dutra V, Yang J, Devlin H, Susin C. Radiomorphometric indices and their relation to gender, age, and dental status. Oral Surg Oral Med Oral Pathol Oral Radiol Endod 2005;99:479-84. Devlin H, Karayianni K, Mitsea A, Jacobs R, Lindh C, van der Stelt P, et al. Diagnosing osteoporosis by using dental panoramic radiographs: The OSTEODENT project. Oral Surg Oral Med Oral Pathol Oral Radiol Endod 2007;104:821-8. Estera M, Vidmantas A, Vytaute P, Marija T, Rasmute M. Relationship between mandibular cortical bone height and bone mineral density of lumbar spine. Stomatologija. 2008;10:72-5. Taguchi A. Panoramic radiographs for identifying individuals with undetected osteoporosis. Japanese Dental Science Review 2009;45:109-20. Mahl CRW, Licks R, Fontanella VRC. Comparison of morphometric indices obtained from dental panoramic radiography for identifying individuals with osteoporosis/osteopenia. Radiol Bras 2008;41:183-7. Mohajery, Mahine and Sharon L. Brooks. “Oral radiographs in the detection of early signs of osteoporosis.” Oral surgery, oral medicine, oral pathology.1992;73:112-7. Bras J, Van Ooij CP, Abraham-Inpijn L, Kusen GJ, Wilmink JM. Radiographic interpretation of the mandibular angular cortex: A diagnostic tool in metabolic bone loss: Part I. Normal state. Oral Surg Oral Med Oral Pathol 1982;53:541-5. Leite AF, de Souza Figueiredo PT, Guia CM, Melo NS, de Paula AP. Correlations between seven panoramic radiomorphometric indices and bone mineral density in postmenopausal women. Oral Surg Oral Med Oral Pathol Oral Radiol Endod 2010;109:449-56. Bajoria AA, Asha ML, Kamath G, Babshet M, Patil P, Sukhija P. Evaluation of Radiomorphometric Indices in Panoramic Radiograph - A Screening Tool. Open Dent J 2015;9:303-10. Gulsahi BW, Prihoda TJ, Glass BJ. Variations in adult cortical bone mass as measured by a panoramic mandibular index. Oral Surg Oral Med Oral Pathol 1991;71:349-56. Otogoto J, Ota N. Correlation between periodontal disease and osteoporosis using panoramic radiographic parameters for diagnosed osteoporosis in dental clinic. Clin Calcium 2003;13:582-6. Yasar F, Akgunlu F. The differences in panoramic mandibular indices and fractal dimension between patients with and without spinal osteoporosis. Dentomaxillofac Radiol 2006;35:1-9. Güngör K, Akarslan ZZ, Akdevelioglu M, Erten H, Semiz M. The precision of the panoramic mandibular index. Dentomaxillofac Radiol 2006;35:442-6. Uysal S, Çağırankaya BL, Hatipoğlu MG. Do gender and torus mandibularis affect mandibular cortical index? A cross-sectional study. Head Face Med 2007;3:37. Zlatarić DK, Čelebić A. Clinical bone densitometric evaluation of the mandible in removable denture wearers dependent on the morphology of the mandibular cortex. J Prosthet Dent 2003;90:86-91. Jowitt N, MacFarlane T, Devlin H, Klemetti E, Horner K. The reproducibility of the mandibular cortical index. Dentomaxillofac Radiol 1999;28:141-4.